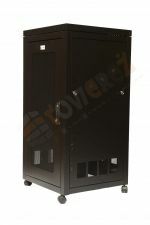 There are many variables to contemplate when you are planning to purchase a server cabinet. The size, weight, height and width of a server cabinet are of vital importance to which fits your specific needs the best. The height of server cabinets are always measured in “U’s”, one U amounts to roughly 44.45mm. It also important to note, to buy a server cabinet with the future in mind, so if further expansion is planned in the future, you will have saved yourself a lot of time and money by buying a server cabinet with some extra space. This ensures there won’t be any unnecessary purchasing of further server cabinets in the future.